Published Aug 11, 2017 by Addison-Wesley Professional. Part of the LiveLessons series. More than 6 hours of video training covering Java Collections, including design considerations and features added with Java 8 and Java 9! Learn everything you need to know to get the most of the Java Collections Framework. Simon Roberts, best-selling Java author and trainer, will detail the nuances of working with collections, so you can better understand the concepts and see firsthand how to use this powerful API. This course is an essential guide to learning how the collections API—which is rich with functionality—can help with regular programing projects. In addition to learning about interfaces, classes, and methods, you will explore design questions, why the API is the way it is, and how you can use it for best effect. You will also learn how to break up complex coding problems and how to more efficiently maintain code. You will actually explore design patterns and principles used in the collections API that are applicable to many areas of programing. 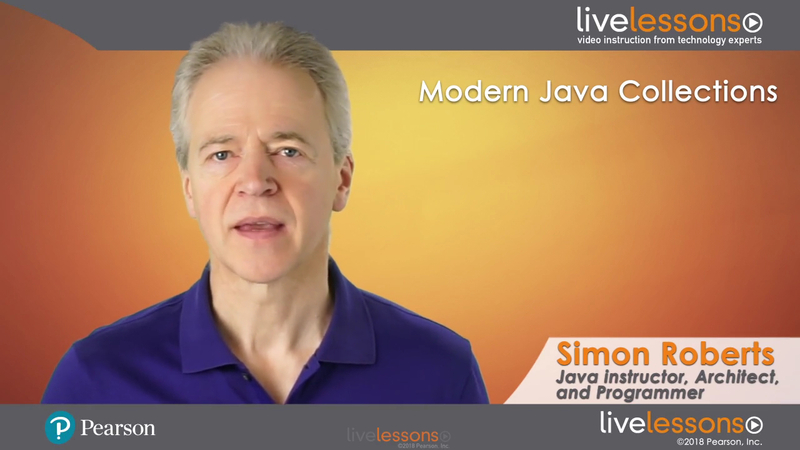 This course takes a different approach from most Java courses, using a story-like approach to teach concepts. Topics start by looking at a problem, considering how it might be solved, and steadily working to more advanced solutions, while building understanding of the concepts, libraries, and syntax being used. You will develop a thorough understanding of each chunk of knowledge, so you are ready to use that understanding in your daily coding. You will start by taking a look at generalization in collections and explore key collection API interfaces. You will then find out why there’s a need for generics, see general tools you can use, and take a look at some use cases. After that you will dive in, exploring investigating lists, array-based implementations of a list, linked implementation, and more. The next step is then understanding iterating collections, equality, orders, hash codes, and hashed storage before jumping into sets, trees, improving designs, maps, implementing the iterator pattern, the new functional methods added with Java 8, and more interfaces. You will then take a look at list implementations and utilities for collections. The course will wrap things up with a section on creating and combining comparators, which includes more functional additions to the APIs. This course will benefit intermediate and advanced level Java programmers looking to develop and solidify their understanding of the core Collections API, or looking to add the functional features that were added at Java 8 to their repertoire. Additionally, because the course investigates design issues and patterns in the context of the Collections API, anyone wishing to improve their grasp of how to apply patterns as part of their software engineering toolkit can benefit. The course also addresses all the Collections-related topics that are essential knowledge for Oracle’s Java Programmer certification (1Z0-809) for Java SE 8, and is of value to anyone preparing for that, or a similar exam. The primary intended audience has an intermediate knowledge of Java. In addition, software engineers who are transitioning to Java from a position of solid experience of another object-oriented programming language in the syntactic traditions of C/C++ should be able to gain full benefit from the course. For example, a candidate with a good knowledge of C# would benefit from this material, even if one does not have prior experience in Java.